Eleven compensation claims have been made after sonic booms from scrambled Typhoon jets caused damage to homes and property - the highest in seven years. One was withdrawn and three payments have been made so far after property owners claimed for damage to doors, windows, roof tiles and ceilings. 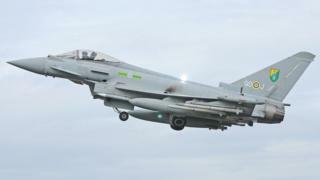 The Royal Air Force (RAF) said inconvenience needed to be balanced with national security. It scrambled Typhoon jets over Yorkshire on 2 May 2016. Figures released under the Freedom of Information Act show there were seven claims for damage from sonic booms in 2012. In other years the number of claims has been four or less. There were no sonic booms recorded in 2015. People across large parts of Yorkshire heard what sounded like two loud explosions on 2 May after the aircraft were launched from RAF Coningsby to intercept an Air France passenger plane, which was not responding due to a radio communication problem. Houses shook as the planes flew over Yorkshire to identify the unresponsive aircraft and accompany it in to land at Newcastle airport. In figures requested by the i newspaper, claims have since been made to the MoD for damage to windows, roofs, ceilings and a fish tank. The figures show eight "sonic incidents", which were likely to be the result of RAF aircraft undertaking supersonic flight, have been reported to RAF police since January 2013. During that time, sonic booms have been heard in Norfolk, Wales, Cambridgeshire and Yorkshire. Dozens of compensation claims have been made to the MoD as a result of these incidents, with a total of £3,576.26 being paid out. An older release revealed a further £1,670.53 paid out in 2012. An RAF spokesman said: "Any inconvenience caused to the public is regretted but this must be balanced against the need to maintain national security in an unpredictable and dangerous world." A sonic boom is created as an aircraft breaks the sound barrier, causing a high-energy shockwave.